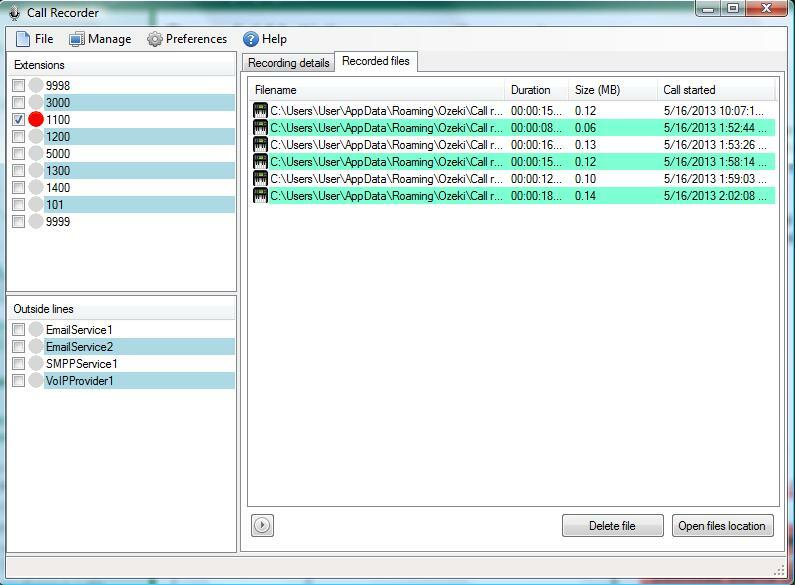 Ozeki Call Recorder is a professional call recording software application which can be used to record phone conversations on multiple phone lines simultaneously. By using this software you can efficiently monitor and evaluate the performance and the quality of the whole call center or just a particular agent. Ozeki Call Recorder allows you to select then record one or more calls. Firstly, you can see in the GUI all of your registered standard outside lines (VoIP service provider, ISDN phone line, PSTN device) and all of your registered extensions (i.e. SIP extensions or mobile clients). You can specify which entity's calls will be recorded. Choose from your registered outside lines and extensions by marking the checkbox next to the appropriate entity. All calls, which take place through the marked entities, will be recorded. Click on the "Preferences" tab in the top of the screen where you can specify your special needs (recording format, recording path, etc.). This configuration will be valid for all the calls. After you have selected the proper entities, recording starts automatically when a call . Next to the particular extensions/outside lines, the red "REC" cirle shows that the recording is in progress. Select an outside line or an extension then click on the "Recording details" tab. Here you can find some recording data for that specific entity in the right side (total saved files, the folder of the recorded call, total call duration, etc.). Click on the "Recorded files" tab to view the all the recorded conversations. Ozeki Call Recorder is a great solution for either for-profit or non-profit organizations where telephone communication has crucial importance. This software enables you to control the call center agents' work by recording their phone conversations then evaluate their efficiency. You can give feedback for your employee in order to stimulate them for more satisfactory performance.